At Park 56 Dental, we’ve been voted the best dentist in New York, so why would you go anywhere else for your care? If you need dental implants, our experienced team can answer your questions about treatment and provide you with the best possible results, so you’ll love your smile again. Dental implants are an alternative to dentures for teeth replacement and are loved by many patients for their natural appearance. Because they don’t require any special care, there is no need for dietary changes or special cleanings. Simply brush and floss as normal, and your dental implants will act just like your natural teeth. Choose the top dentist in NYC for your dental implants, and make an appointment at Park 56 Dental. Our team will work to keep you comfortable throughout the process and will design implants that blend into your smile seamlessly. Call our dental clinic in NYC today at (646) 783-3529 to make an appointment. If you’re like many people, the reason you most often find yourself at the dentist office is for a checkup and cleaning, so you may be surprised to know just how many dental specialists are also providing care. If your dentist discovers an issue during your appointment, he or she may refer you to a specialist for treatment. 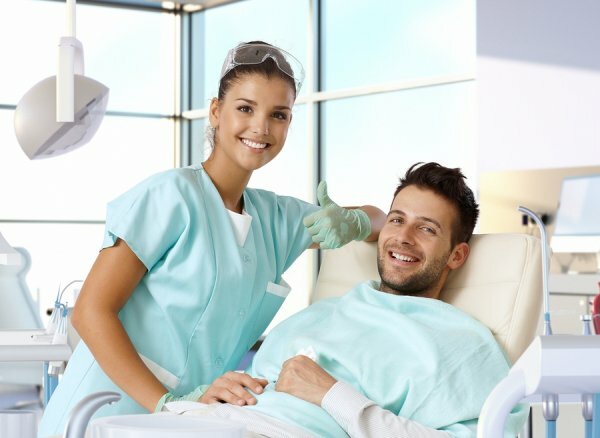 At Park 56 Dental , where we have been voted the top dentist in NYC, we have several in-house specialists who provide the highest caliber of care. Here is a closer look at some of the dental specialty fields in which you may need care. Prosthodontics is a specialty field within dentistry that is concerned with designing, manufacturing, and fitting artificial restorations for the mouth. If your dentist recommends that you get dental implants because of tooth loss, he or she may refer you to a prosthodontist for treatment. Because of their specialized training, these dental specialists can provide the best possible design and fit of restorations like dental implants, so that your results are as a natural and comfortable as possible. If your teeth are not as straight as they could be, or if you issues with your bite, then you may need to see an orthodontist. Orthodontists are skilled at evaluating facial structure and determining what teeth or bites should be aligned. They use treatments like braces and Invisalign to help people improve their smiles both cosmetically and in terms of their overall health. Periodontists focus on gum health and the treatment of gum disease. When gum disease has advanced too far for your dentist to treat, he or she may send you to the periodontist for more extensive care to prevent tooth loss and other serious complications. In some cases, periodontists can also help with cosmetic treatments, such as removing excess gum tissue. At Park 56 Dental, we offer comprehensive care for the diagnosis and treatment of a range of dental issues, with the right specialists for your need. Visit a top dentist in NYC by making an appointment at our dental clinic by calling (646) 783-3529. Brushing isn’t always a favorite activity for young patients, but regular brushing teaches kids healthy dental habits that last a lifetime. Set your child up for good oral health by choosing the top dentist in NYC for his or her care, and make brushing fun with the tips in this video. Enlist your child in picking out his or her own toothbrush and toothpaste so they are more fun to use, and consider playing a favorite video for the two minutes your child should brush to help with timing. Your child may not understand the threat of a root canal or dental fillings, but he or she can understand that brushing fights the bad guys, like bacteria and plaque, so try making brushing a superhero activity. Find out for yourself why we were voted the top dentist in NYC by making an appointment for your family at Park 56 Dental . To make an appointment for a dental cleaning in NYC, call (646) 783-3529. Here at Park 56 Dental, it’s our mission to go above and beyond to support the oral health of each of our valued patients. We’re proud to offer emergency dental care at all hours to New Yorkers. Our on-call dentist can respond quickly to patients who have sustained a knocked-out tooth, severe toothache, or object caught between the teeth. Our dentists treat broken and chipped teeth, severely bitten lips and tongues, and even broken jaws. Our dental clinic offers extended hours on most days. If you experience a dental emergency while we’re open, please call our office directly and rush right over here. Our dentists will see you as quickly as possible. If you have a dental emergency after hours, you can call our emergency line at any time of the day or night. Our on-call dentist will assist you. In the rare event that you cannot get in touch with our on-call dentist, please call 911 or visit the nearest emergency room. Emergency dental care in NYC is just part of what we do here at Park 56 Dental . Call (646) 783-3529 to request a consult with one of our friendly dentists and we’ll design a customized smile restoration plan just for you.